I’d seen this quote around, but someone asked me about it on Twitter yesterday, which prompted me to write it up. Although it’s quoted all over the internet, and in at least one book, as being the words of the Buddha, it’s not a scriptural quotation, and is intead from Jack Kornfield’s lovely book from 1994, Buddha’s Little Instruction Book (page 85). It’s a great book, and I’d highly recommend it. 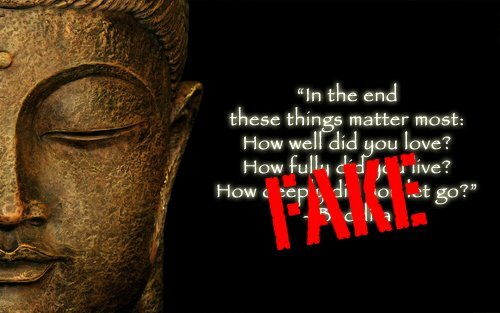 Some of the quotes are based on material from the suttas, but usually re-written, and most of the material seems to be Jack’s own thoughts. Jack may have modelled this saying on a passage in Danielle Marie’s 1992 Straight From the Heart: Authors, Celebrities & Others Share Their Philosophies on Making a Difference in the World. The similarity may be a coincidence, however. Giveways that this is not a genuine quote from the scriptures? The whole thing is too neat compared to the rather repetitive language used in most of the Pali canon, the Buddha isn’t recorded talked in terms of how fully people lived their lives, or how well they loved — these are rather contemporary idioms — and although the language of “letting go” is used in the canon, it’s rather rare. When added to the two other, more modern expressions of “loving well” and “living fully,” the whole suggests a contemporary and western rather than an ancient and Indian source. so if i were to paraphrase this quote for an essay, who should i give credit/ cite to? I think it should be Jack Kornfield, Camille. I just used the “often attributed to” rick in a piece of writing, although I did mention that the quote in question certainly wasn’t by the author it was attributed to. I’d have hoped that Wisdom would have pushed for a better citation in this case.